The outside sales division of Guitar Center that focuses on the needs of professional users, Guitar Center Professional (GC Pro), outfitted one of the largest mixed-use developments in the Southeast, Avalon, with a multi-use sound system to elevate the overall guest experience. Developed by North American Properties (NAP), Avalon opened late last year in the Atlanta suburb of Alpharetta. The $600 million, 86-acre live, work, play community includes 500,000 square feet of retail, chef-driven restaurants, Class A office, luxury rental homes, single-family residences and a planned full-service hotel and conference center. One of Avalon’s biggest differentiators is its promise to be more than just a place to shop or dine – it’s a place to be, which is why NAP decided to equip Avalon’s outdoor Plaza with a state-of-the-art sound system. The Plaza is now a fully functional performance stage, which enhances the Avalon experience, whether it’s in the form of an outdoor concert, fashion show or chef demonstration. 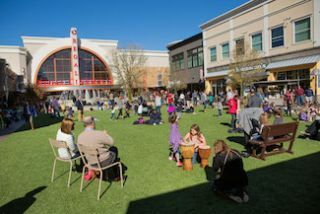 The multi-purpose Plaza at the Avalon mixed-use community in Alpharetta, Georgia, featuring audio components sourced through Guitar Center Professional. Photos courtesy of North American Properties (NAP). © 2015.“We’re thrilled to provide an elevated sound experience for our guests who come to Avalon as their ‘third place’ – a place to spend time and enjoy life with family and friends outside of work and home,” said Wayne Rigsby, manager of guest experience for NAP. The Plaza’s sound system is composed of two Danley OS-80 and two OS-115 all-weather speaker cabinets powered by three Crown XTI amplifiers, a Crown DCI amplifier that powers several speakers surrounding the large fountain, and all managed by a dbx DriveRack 4820 speaker processor. The system is protected by two Furman CN2400S networked power sequencers and two APC commercial grade UPS (Uninterrupted Power Supply) units. The sound can be managed from anywhere, thanks to the integration of a Savant automation system that enables control over Wi-Fi through an Apple iPad. The sound system was installed through GC Pro’s Affiliate Program, which matches a customer’s installation and integration needs with the best available systems integrators. Commercial Sound & Video installed the sound system, while Profound Dimension did the programming of the Savant automation system. A similar system, whose components will also be sourced and installed through GC Pro, will be installed at another nearby North American Properties development, Atlantic Station, in the near future.